My wife Charlie started the ethical fashion label SAHEL Design, seeking to celebrate and revive traditional crafts in Burkina Faso. 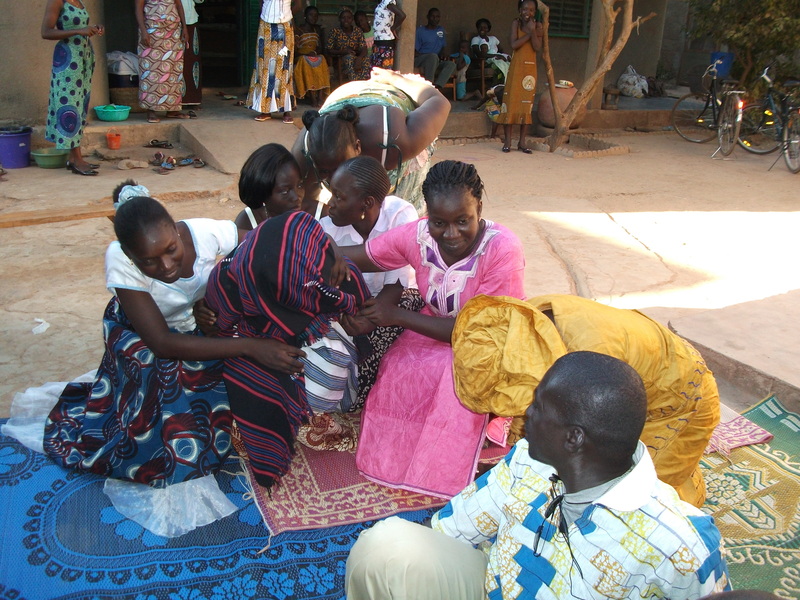 This week we are thrilled to be working with Friends in Action, drilling for water in the far north of Burkina Faso, in two of the villages where SAHEL Design is involved. 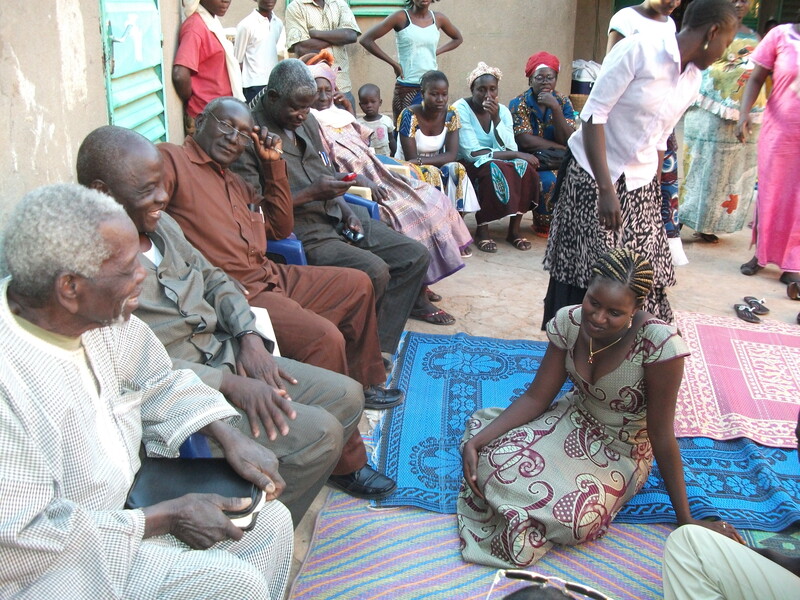 Yesterday we were in the village of Ousmane the weaver. Last night we arrived in the village at about 7pm and started drilling. The night was long and very dusty, but at about 2am the dust stopped billowing out of the bore hole, which I gather is an encouraging sign! Ko jemma boni fu, weetan goes the Fulani proverb. Even if the night is hard, morning will come. Many thanks to Mark Collier and Tim Wilson for their tireless work. Today we are going to the settlement where the leatherworkers live. Please pray that we find water. Last night Burkina Faso played Algeria in their last World Cup Qualifying match. If they had won or even drawn, they would have been sure of going to Brasil for their first ever World Cup. They lost. This afternoon I went into a hardware shop to buy a mousetrap. The shopkeeper was not concentrating. He was looking over my shoulder at someone talking in the street outside. ‘I need a mousetrap,’ I repeated. ‘We’ve got it!’ he yelled. I thought his excitement over having a mousetrap in stock was a little extreme. A moment later, the shop was full of young men and women, punching the air and doing complicated ‘Ouagadougou finger-snap’ handshakes on each other. A moment later he made an announcement almost too good to be true. FIFA had held a post-match inquiry. Algeria’s goal had been disallowed. Therefore Burkina had qualified for Brazil 2014! Twenty butchers in the abbatoir gave a massive cheer and started hugging each other and dancing. Two of them leaped onto the back of a third, and hared off down the street in a joyous double-piggyback. In the tailor’s workshop opposite, a massive amplifier was switched on and celebratory reggae filled the air. Women at their market-stalls started dancing behind their bananas and watermelons. 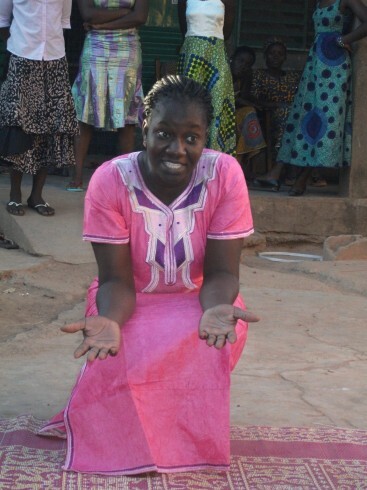 ‘Ko jemma boni fu, weetan,’ remarked an old Fulani man, sitting cross-legged outside the mosque. Even if the night is bad, morning comes. Spot on. Burkina Faso had passed a night of crushing disappointment, and that made the sudden good news all the sweeter. 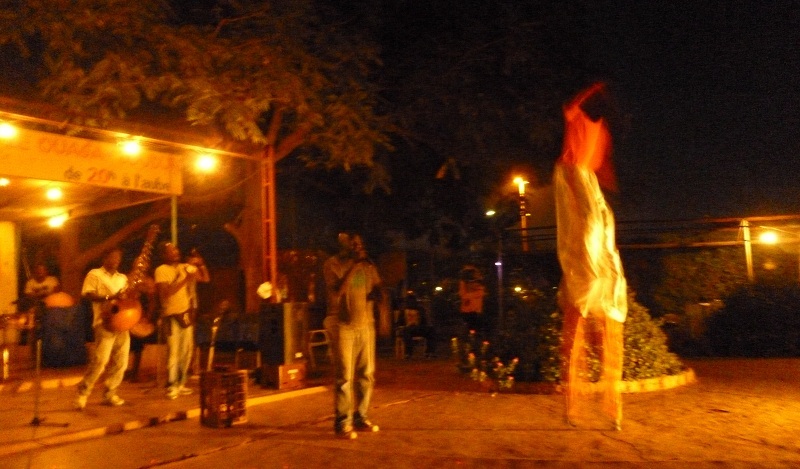 Local radio stations were talking of nothing else, so it was not long before Ouagadougou’s heaving lanes of traffic had heard the news as well. Those in cars started beeping their horns. Those on motorbikes opened up their throttles and flew. Some weaved from side to side, some stood up on their footrests, some rode with their metal bikestands down, creating a fizz of sparks along the tarmac. Half an hour later the joy subsided, as quickly as it had begun. People sat down in small streetside groups and listened with their heads in their hands as radio stations dispelled the rumours they had themselves begun. ‘Le Faso, c’est un pays qui aime les rumeurs,’ commented a university student wryly. Burkina Faso is a country which likes rumours. So what do the Fulani of Burkina Faso eat? Answer: they eat nyiiri hoy – millet dumpling with sauce. And here’s how it’s made. Format VideoPosted on August 30, 2013 September 25, 2017 Categories Life in West AfricaTags Burkina Faso, FulaniLeave a comment on So what do the Fulani of Burkina Faso eat? May I hold your baby? 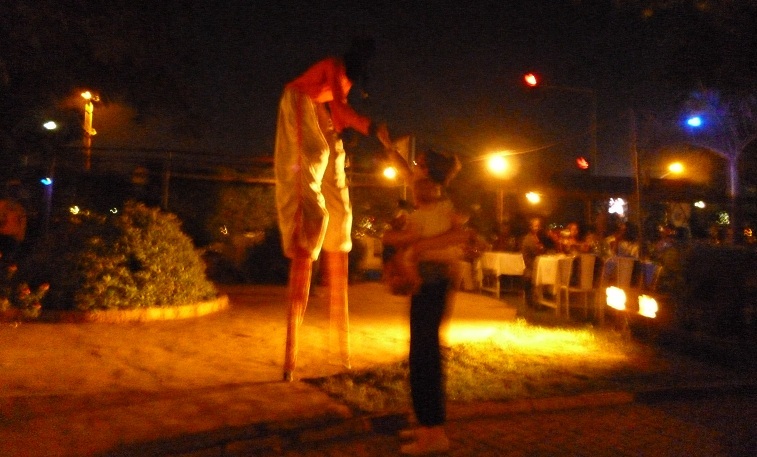 So the other night we’re at the Jardin d’Amitié in Ouagadougou, and there’s a Dioula stilt dancer strutting his stuff. Charlie goes over to say hello. She’s holding Daisy (10 months). Stilt Dancer Man puts his hands out to take the baby. 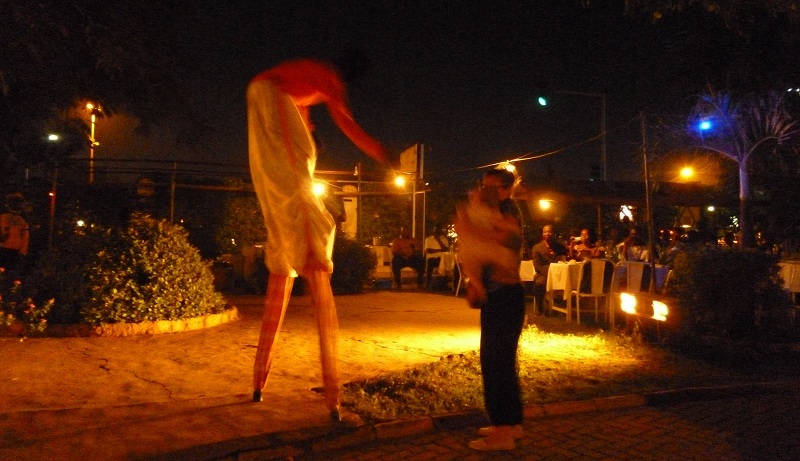 Should Charlie give Stilt Dancer Man the baby, or not? 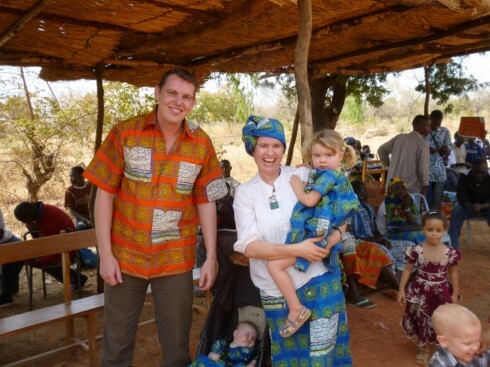 Posted on August 24, 2013 January 14, 2016 Categories Life in West AfricaTags Burkina Faso, OuagadougouLeave a comment on May I hold your baby? 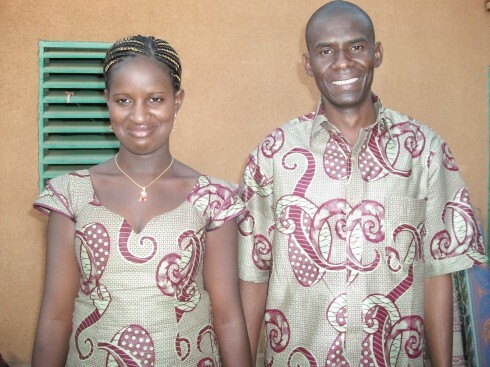 A Fulani engagement party is the ultimate exercise in playing hard to get. It starts with the man and his friends/uncles turning up at the mother-in-law’s compound and being served a cornflour drink with lots and lots of salt in it. 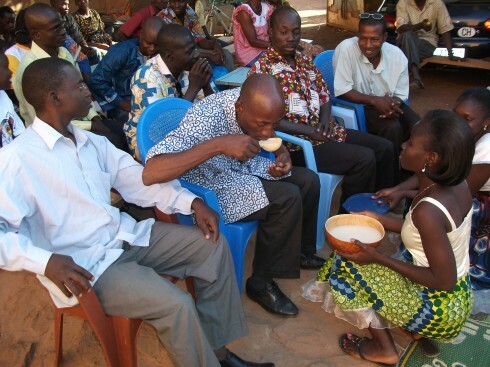 The man and his comrades have to demonstrate their good intentions by drinking the calabash dry. Then a series of women are brought out, covered by a big piece of cloth. The man has to say whether each one is his girl, or not! For each wrong guess, he has to pay 5000 Francs. Finally, the girl is guessed correctly and revealed for who she is. Now the real negotiations can begin. The friends of the man go to the formidable aunts on bended knee to beg on the man’s behalf for the girl’s hand in marriage. An accord is struck, and the dancing begins. Finally, the happy couple can be said to be engaged. The wedding will follow in a few months, and this time the cornflour drink will be sweet, not salty. We have been back in Africa for nearly two months now. The troubles in nearby Mali made us decide to leave Djibo, so we have moved to a town in the south of Burkina Faso. We never intended to live in Djibo the rest of our lives – we probably would have relocated sometime this year war or no war – but I’m missing it all the same. I miss the sand and the cows and the rounded grass houses. I miss our friends and neighbours. Most of all, I miss being able to understand what people around me are saying. For the time being I am still working as West Africa coordinator of Christian mission movement World Horizons. And I’m still writing. Currently working on two adventure books – one set in Dakar and one in Victorian London. Very excited about both of these projects. Meanwhile my wife Charlie is working hard finding wonderful bags and jewellery for Jam Shop – take a look. My wife Charlie has been working with Ussman for a couple years now. He’s the best weaver in the province of Soum, producing fine cushion covers and blankets on a loom made of twigs and twine. 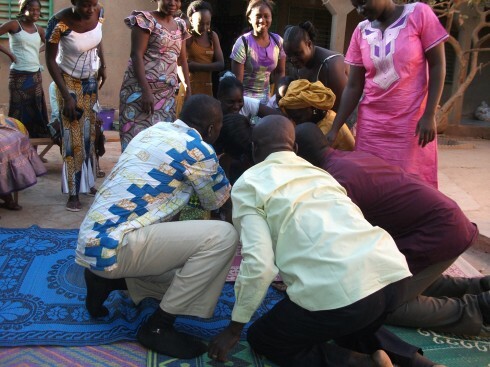 Now, thanks to his involvement with Charlie and SAHEL Design, Ussman is building a teaching centre to pass on the skill of traditional weaving to future generations.